As can be seen on the bottom map in the link below, the risk of zinc deficiency is low in North America, but there are other places in the world where it is much more common. 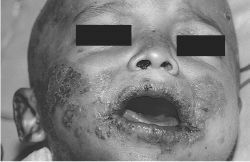 In the link below you can see a picture of an infant with dermatitis caused by zinc deficiency. Another cause of zinc deficiency is mutation of ZIP4 that results in the condition acrodermatitis enteropathica. Without ZIP4, zinc cannot be taken up efficiently into the enterocyte. This condition is managed by administering very high levels of zinc, some of which is absorbed through other mechanisms3. Chronic toxicity can result in copper deficiency, as will be discussed in the copper section3. 2. Byrd-Bredbenner C, Moe G, Beshgetoor D, Berning J. (2009) Wardlaw's perspectives in nutrition. New York, NY: McGraw-Hill. 3. Gropper SS, Smith JL, Groff JL. (2008) Advanced nutrition and human metabolism. Belmont, CA: Wadsworth Publishing.